A bit of a short Cthuesday blogpost today, as I'm going to be spending my evening actually running Call of Cthulhu instead of merely writing about it. I'll be running an adventure I've taken to calling "The Parsonsville Horror," which is a revised version of my scenario "The Get of Belial," improving on weak points identified during play. Because of that, today's monster is one I started tweaking and re-imagining a while ago, and had just never put down on digital paper. 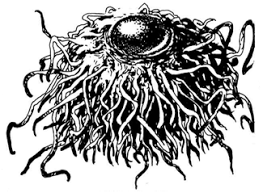 Originating in Henry Kuttner's short story "The Invaders," today's Cthuesday Creature is the interdimensional Ny'ghan Grii. These have not seen a lot of use in published scenarios; about the only one I can think of is the scenario "Dead Light" in the Chaosium collection Terrors From Beyond; I've only ever run a rewritten version of the scenario replacing the three Ny'ghan Grii with a single Hound of Tindalos, so I can't really say how these creatures function in game as written. The Ny'ghan Grii are said to lurk around places where the boundaries between dimensions are thin, awaiting sacrifices to allow them entry into our world - failing that, they can slip through whenever someone messes too much with the space-time continuum, such as, in the original story, taking drugs that send one's mind on a trip through time (and personally, I'm convinced that the time-drug taken in Frank Belknap Long's "The Hounds of Tindalos" is the same drug taken in Kuttner's "The Invaders") or casting spells that warp the fabric of reality. As such, I think the easiest way to use the Ny'ghan Grii is to sub them in for a Hound of Tindalos - though the Ny'ghan Grii are easier to kill or drive away than a Hound - or place them as a hazard in a scenario focusing on the Great Race of Yith. 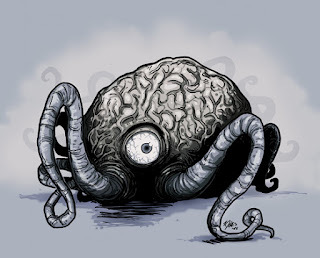 They could also be servitors of a Great Old One such as Daoloth, the Render of Veils, or even of Yog-Sothoth. Chilling Blast: by spending two Magic Points, the Ny'ghan Grii can create a blast of icy, numbing air, five feet wide by fifteen yards long, dealing 1d6 damage to creatures caught within the blast. This attack can be Dodged. Devolution: by spending 2d6 Magic Points and winning an opposed POW roll against a target, the Ny'ghan Grii can send the target on an irrevocable backward slide down the evolutionary ladder, regressing them through successively painful and bestial transformations into prehuman forms, before ultimately reducing them to a puddle of primordial ooze after 2d6 combat rounds. Witnessing this being done to someone costs the viewer 1/1d6 SAN. Armor: 4 points of rugose alien hide. Spells: Ny'ghan Grii know 1d6 spells on a successful INT roll. Sanity Loss: 0/1d6 to see a Ny'ghan Grii. Looking at the stats, it's clear these creatures are not masterminds; their intelligence is only equivalent to human average and their POW stat only a little above human average. So they aren't going to be geniuses, but I don't think mindless monsters is the way to play them either. Keeping in mind that they're slow and somewhat clumsy creatures, I'd be inclined to play them as cautious, cunning entities that will set traps and ambushes, using their supernatural abilities to separate humans and force them to go where the Ny'ghan grii want them to. They're going to rely on their ability to blast cold air and their de-evolutionary abilities to terrorize and conquer. However, there's one thing worth noting in their stat-block; there's an average chance of them knowing 1-6 spells. I've come around to the opinion that whenever possible, you should equip monsters with spells, and the selection of spells they have can make a monster feel radically different; in the last Cult of Chaos game I ran, I had a Star Vampire with a selection of mind-controlling and hypnotic spells, which it used to divide the investigators and turn them against one another. It added a whole new dimension of at least uncanny, if not actually fear, to an invisible blood-sucking octopus. So what spells would be useful for the Ny'ghan Grii? Well, here's where my encyclopedic knowledge of cheesy monster movies kicks in. The Ny'ghan Grii remind me very much of the titular creatures in the film THE CRAWLING EYE (also known as THE TROLLENBERG TERROR). In the film, alien creatures are invading Earth starting with the environment closest to their native world - high mountain tops. From there, they are slowly acclimating their way down towards civilization. These aliens have some nasty abilities such as to telepathically lure victims to them, and reanimate their corpses to use against their friends. Use that! Jiminy Christmas, if you can't get a creepy scenario out of a monster luring your friends to it, killing them, and sending their still-warm carcasses out to kill you (see also Robert E. Howard's "Pigeons from Hell") then you should be running something other than Call of Cthulhu. To recreate the powers seen in the film, I'd give the Ny'ghan Grii the spells "Mental Suggestion," "Create Zombie" and "Create Mist of R'lyeh." Let them hide out in supernatural fog, luring their victims to them, then sending zombie minions out to round up more victims. Keep their de-evolving power on the down-low, something that's used strictly as a last resort - with its swingy, potentially-too-high Magic Point cost (2d6!) and the fact that it's likely to be a game-ender for at least one player-character, it's the sort of thing that's an all or nothing weapon to be brought out at the climax of a scenario. If you've got more spell slots available, I'd throw in things like "Wrack" and "Curse of the Putrid Husk" and make the creatures a species of sadists. This results in a monster that feels very different from the tittering, luminous creatures sneaking around the beach-house looking for an entrance in the original short story. It adds a lot more mystery and makes them much more sinister and insidious. Disguise the swipe from your movie-loving players by moving the locale from a frozen mountain-top to a backwoods swamp overlooked by a teetering, decrepit house (as just one example). Make that why the creature's here. Maybe it was consciously summoned by a deranged low-country warlock, or maybe it snuck in while he was trying to cut a deal with Yog-Sothoth. The warlock has been de-evolved into an pre-hominid or lower and is running around as a physical threat, but the Ny'ghan Grii has been patiently waiting in the house for other humans to come by. I might be working out my own adventure for the Ny'ghan Grii with that, so let's get away from the backwoods swamp warlock before I tip too much of my hand; you never know when someone who might play in one of my games might be reading this. Honestly, I think the Ny'ghan Grii really need this sort of "face-lift" - no disrespect meant towards Henry Kuttner, but the Invaders as originally presented...are kind of a lame monster, and I think that's a big part of why they only appear in one published scenario. 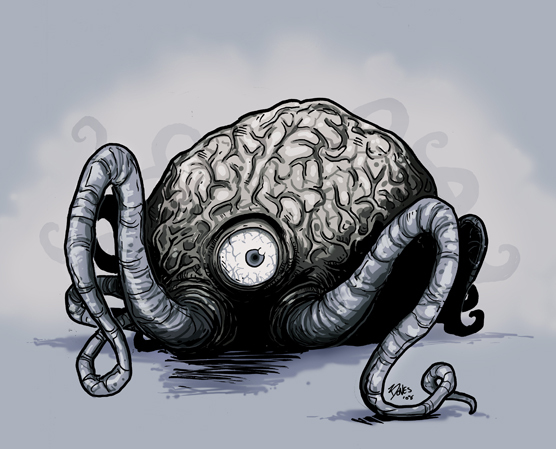 They have elements of some of the great nasties of the Cthulhu Mythos, just not the great elements of those nasties - they've got the time/dimensional connection of the Hounds of Tindalos, the wind-manipulation of the Flying Polyps, and the distinctly un-menacing vocalization of the Star Vampires. But the resulting blend is just kind of lukewarm, rather than being a creature of menace. I think this is actually a good place to wrap up discussion of the Ny'ghan Grii; now that I've shown you how I would tinker with and use this monster, I'd love to see other peoples' spins on them. How would you use the Ny'ghan Grii in a game? Cult of Chaos: "The Parsonsville Horror"